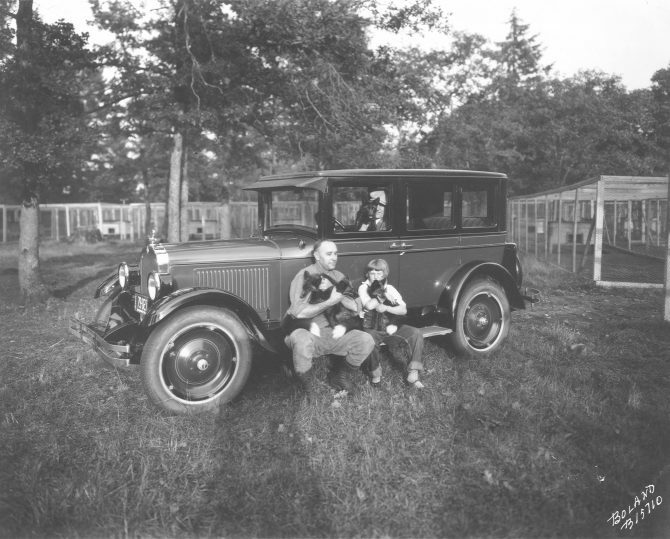 Tacoma Silver Fox Farm owner George H. Jensen and daughter Barbara Ellen perch on the running board of his new Oldsmobile Six sedan in late September of 1926. They are holding prize brush and white-tip foxes from the same litter. The man in the sedan with another fox was not identified. Mr. Jensen, who had recently accepted delivery of the car from Winthrop Motors, was planning a 3000-mile trip in it to inspect foxes for registration for the American National Fox Breeders Association. He was expected back by November 1st to get his own foxes ready for the national fox show in Portland.